Requiem Faure "By Gabriel Faure (1845-1924). Edited by John Rutter. For SATB choir, soprano voice solo (Accompaniment: Keyboard). Sacred, Concert. Medium Adult. Extended works. 54 pages. Duration 30 min. Published by Hinshaw Music Inc."
"Elegie, Opus 24" "By Gabriel Faure (1845-1924). For cello and piano. Classical Period. Difficulty: difficult. Instrumental solo book. Piano accompaniment, fingerings and bowings. Composed 1879. 9 pages. Published by International Music Company"
13 Nocturnes for Solo Piano "By Gabriel Faure (1845-1924). Edited by Roy Howat. For Piano. This edition: Urtext. SMP Level 10 (Advanced). Sheet Music. Text Language: German/English/French, critical commentary - English only. Published by Edition Peters"
Sicilienne Op. 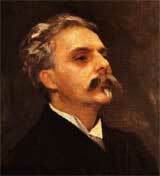 78 "By Gabriel Faure (1845-1924). Edited by Howat. For Violin/Viola, Piano. Sheet Music. Published by Edition Peters"
"Trio, Op. 120 for Piano, Violin and Cello" "(Score and Parts). By Gabriel Faure (1845-1924). Piano trio. For piano trio (violin, cello, piano). Editions Durand. Full score and set of performance parts. 62 pages. Editions Durand #DF1034700. Published by Editions Durand"
Apres Un Reve (After a Dream) "(After A Dream). By Gabriel Faure (1845-1924). For Violin Solo, Piano. Solo part with piano reduction. Standard notation. 5 pages. Published by Carl Fischer"